Maybe you dreamed for years before becoming a professional writer. Maybe you’re still dreaming, trying to work up the courage to take that mighty leap. Once you do, you immediately find out that the dream of writing for a living tends to collide with the nightmare of meeting your deadlines. Not to mention keeping track of multiple projects, leaving enough time to produce quality work, making time to do your own marketing, and remembering to actually invoice your clients. It’s one thing to write for your own enjoyment, when you feel you have something to say. But professional writers need to layer on another set of skills. When we think of terrific professional writers, we usually think of abilities like a beautiful writing voice and a superb grasp of strategy. And those are both important. There’s also a trait you might not think about as often — and clients are desperate to find it. That underrated trait is reliability: doing what you say you’ll do, when you say you’ll do it. For some odd reason, we all think that we should innately know how to do this. That being a reliable person is the same thing as being a good person … and that if we struggle with deadlines or workload, it means we’re lazy or somehow unworthy. But being productive is a skill. 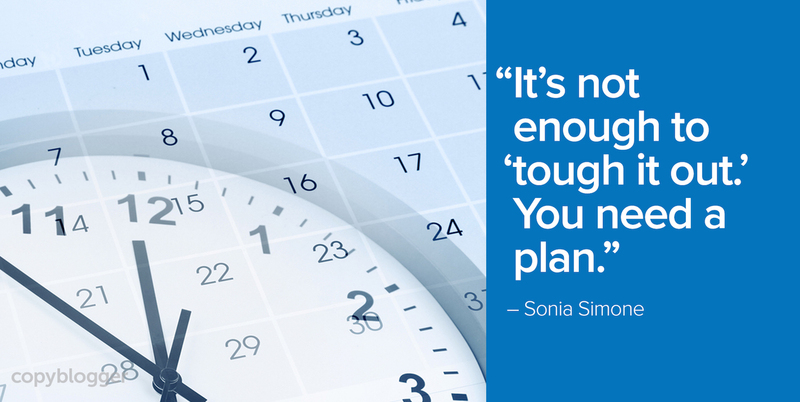 And if you’re struggling with your output, it’s not enough to try to “tough it out.” You need a plan. Try putting these three pieces in place, and see if it helps restore a little of that dreamlike magic to your professional writing life. Regular people can “wing it” with their productivity. A pad of paper or an app for a to-do list will meet their needs. Creative professionals, on the other hand, need to get serious about staying organized. If you write professionally, in any capacity, you’ll be much happier when you settle on a reliable, consistent system to keep track of all of your obligations, deadlines, client conversations, reference materials, and the other details that can make you crazy if they get away from you. And partly because you’re a creative person, a one-size-fits-all productivity system probably won’t fit you particularly well. You’ll want to take the time to hammer out your own personalized systems for staying organized — and stick to them. Being productive isn’t just about making sure you aren’t forgetting any deadlines — it’s also about creating your own systems to produce high-quality work, steadily, and in enough volume that you can make a living. Professional writers don’t start every piece from scratch. They have a set of creative routines, just like a potter or a painter would have, to go from the spark of an idea to a polished, finished piece of work. Having rock-solid creative processes also helps to keep writer’s block at bay. You’re less likely to get overwhelmed by all the questions you don’t have answers for yet … and more likely to focus on the well-defined next step in your process. Of course, if you want to see success as a professional writer, your work has to be good. In fact, it has to be very good. But good work usually doesn’t flow out on your first draft. Instead, it’s the result of applying a practiced eye, and carefully editing and smoothing out your draft until it’s got that professional polish. Companies and clients that hire writers want to know that they’re paying for work of a consistent quality, every time. And weird errors are embarrassing for everyone. Successful pro writers take their polishing work seriously, and they allow enough time to get it done to a high standard. You may have all of these nailed. In which case, you might already be one of our Certified Content Marketers. But if any of these still feels like a challenge, we have a resource for you. It’s designed to fill the “gaps” that we tend to accumulate when we teach ourselves the craft and profession of writing. We’re calling it Creative Content Foundations, and it’s designed to make sure that everything you create is built on solid ground. If you want to be notified when we’re ready for our first group of students, just drop your information into the form below. We’ll be delighted to have you in the course! You definitely need a plan! Not just as a writer and freelancer, but as a business owner. If you are building your own business, in anything, you gotta have a proven plan to follow. You are right, you must have a strong productivity system in place too. You have to work at a high level if you want to get high levels of success. There is no doubt about it. Also, the same goes for creativity. You actually have to work at it in order to improve it. Just like with anything else, if you don’t use it, you lose it. Right! In my career, I’ve found that a solid productivity process is one of the keys to staying focused and moving forward. Thanks for sharing this – lots of great info for business owners. Thanks for your insight, Sonia. In my experience, there’s nothing more scary than to sit in front of a blank sheet of paper or a blank computer screen and know you’re coming up on a 750 word deadline. That’s why a plan on how to fill that blank computer screen is as important as what ends up on it. Filling that blank screen on time with truly original, interesting, informative content is a struggle because it demands discipline, but with a creative flair. Left and right hemispheres must work together to accomplish that task. And that’s why having a plan is so important! For me productivity is a parameter in terms of both effectiveness (accounts for quality) and efficiency (accounts for on-time completion ). I think the creative routine is the bit that I worked on – I started out writing fiction, and I always write in eight-minute bursts at lunchtime. So I’m trying to replicate that in my copywriting, knowing that’s when I write with the best flow, so I can devote other parts of the day to editing, research, promotion etc.